is introductory dive with Poseidon Mark 6. 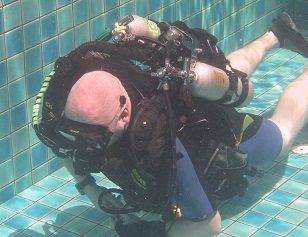 Meant to give YOU experience into Rebreather diving in the pool with Rebreather Instructor. You need to be 18 years old certified diver with 15 dives in order to try. We start with paperwork and go through a small brief into most important things in Rebreather Diving that you need to know in order to dive safely. It takes about half an hour after which it is time to go into water. We make introductory in a pool or maybe in confined water area. First we go into water and there I will help you gearing up and check everything is ok. Then we do a couple of exercises at surface before it is time to go under water. In water we check how equipment work and set loop to be ok. Then you can go around pool under my supervision. Be aware that you are likely to go between bottom and surface all the time, at least in beginning. 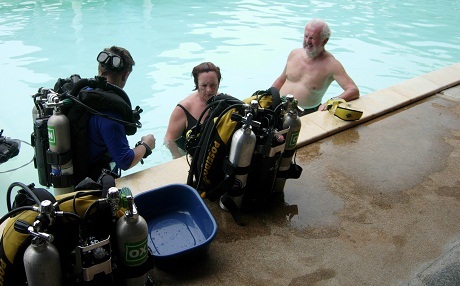 If you like experience you can start with Rebreather Diver course. With this experience you can also try which machine you want to do your PADI Rebreather Diver course with or maybe which unit to buy. I want to try, pls contact me Next introductory dive as you wish. It only costs thb5000 incl. Poseidon MKVI/se7en and scrubber.